I've been making a lot of things from Michael Symon's Live to Cook -- I can relate to its midwestern perspective. The degree of difficulty is just right for me, the food is tasty, and it's a Ruhlman project (that's why I bought it), so the writing is excellent too. When I made the Italian Braised Beef with Root Vegetables, which Symon credits to his Italian mother and grandmother, Carol, the Italian grandmother who babysits for Vivian and Julia during the week, said it was exactly like what she makes -- and delicious. So score 1 point for authenticity. Carol has since made several recipes from the book, including the Spicy Tomato and Blue Cheese Soup and Thanksgiving Turkey, that she was happy with. This is relevant because I often cook things that I've never eaten, particularly prepared well, so I'm not the most valid cookbook reviewer. The Crab Tater Tots yesterday were a little disappointing. I botched the proportions and ended up with too much potato, so there wasn't enough crab to stand out as an appetizer. Also, if you're serving them that way, you really need a sauce, which I didn't have. The good news is that I don't really think ppommes dauphine, the basis of the dish, really need crab to be good, which is, of course, much cheaper anyhow! I made the Butter-Poached Wild (farmed in this case) Salmon with Shallots and Thyme this week. I grill Salmon medium-rare over charcoal, and I'm paranoid about drying it out in the oven, and I just avoid cooking it inside. But Jennifer and the girls like it so I need to find a technique I like in cold months. This is a bit of a commitment because you have to dedicate two pounds of butter to the cause. The upside is you can strain, refrigerate and re-use the butter, both for more salmon and as a quick sauce for veg, etc. The title is a little misleading because you also add the juice of four oranges and a lemon to the poaching medium, so citrus is the main compliment to the butter flavor. Overall it is fairly easy, slightly time consuming and comes out pretty much as you'd expect. The butter is a particularly delicious sauce. My various thermometers gave me a wide variety of readings during the poaching process, which wasn't helpful. I think this was just because there was a wide range of temperatures from the top to the bottom of the saucepan. I think I overcooked the fish just a little but the appeal of this method is a high margin for error. I've still got the butter so I'll be trying this a few more times in the next month or so! I'm trying to avoid stunt deep frying, and it feels like Fried Brussels Sprouts with Walnuts and Capers is getting close to the line. At first, at least, but it doesn't seem that weird when you actually do it. It isn't like you're coating them in batter or anything. In this case I decided that a little chimichurri was close enough to the sauce, and didn't worry about the walnuts or parsley. So it was pretty much Fried Brussels Sprouts with Chimichurri and Capers. 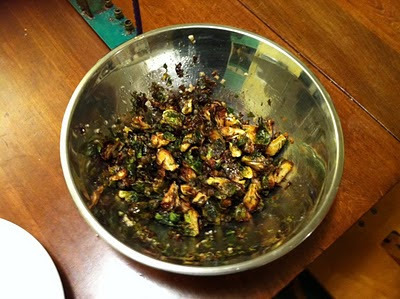 I'd recommend deep fried brussels sprouts if you're going for a serious steak house style dinner. If you want to go a little over the top, this is a good route. Salmon in the winter: Learn the wonders of pan roasting. Set your oven to 425. Get a good quality saute pan very hot until oil smokes. Sear filet on one side until salmon pulls easily away from the pan. Finish in the oven in about 5-10 minutes depending on thickness of your filet. Crusty on the outside and rare and moist on the inside. Yeah, I do a lot of pan roasting. It is wonderful! I guess I've just had a mental block about pan roasting salmon.